At the start of the year the horizon seems to be dominated by the issue of the possible withdrawal of US troops. In reality however the more important action is elsewhere. Every day that passes seems to bring fresh evidence that Trump’s decision is being walked back. But appearances can be misleading, writes former UK ambassador to Bahrain and Syria, Peter Ford. Trump’s ultra-hawkish National Security Adviser, John Bolton, is touring the Middle East apparently setting new conditions for the withdrawal with every stop he makes. We are currently told that the troops will not leave until the remnants of ISIS are mopped up, until there is certainty they cannot remerge, until Erdogan promises not to slaughter the Kurds, and until Israel’s security is absolutely assured. It is certainly true that crushing those ISIS remnants could take some time, and as for ensuring that ISIS can never re-form that is a recipe for a never-ending US presence. The US allies, the Kurdish-dominated SDF, are currently retreating from parts of Eastern Deir Ez Zor because they are meeting hostility from Arab villagers, who resent the abduction of their young men and even children into the ranks of the SDF. While the departure of the sprinkling of 2000 US troops will hardly leave a vacuum as far as the fight against ISIS is concerned the departure of the SDF from certain areas certainly will. Only the government’s Syrian Arab Army (SAA) could enter these Arab areas, and that is precisely what some clan leaders are calling for (calls ignored of course by our media). Extracting assurances from Erdogan is also likely to prove difficult, especially if (like Bolton, no doubt) you will perhaps not strain every sinew to extract them. Erdogan however has already said that he will have no need to invade if the Syrian Army interposes itself in a 40 mile deep buffer zone. 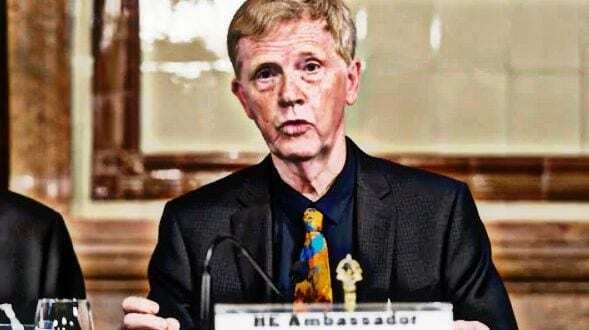 To guard against this possibility of receiving yes for an answer Ambassador James Jeffrey, presidential envoy for Syria, is being despatched to talk to the Kurds and deter them from pacting with Assad and the Russians. What will happen to the Kurds? The irony here is that it is the very presence of the US (and UK) forces which prevents the US conditions for withdrawal being met. While the US refuses to cooperate with the Syrian Army and Russia in fighting ISIS the holy warriors will always have somewhere to hide. And while the US keeps promising protection to the Kurds, and the Kurds believe them, then the YPG will go on infuriating the Turks and the Turkish threat will not go away. But will the Kurds believe Jeffrey? Will they put their entire existence at the mercy of Trump’s whims and a frayed US tripwire? It seems not, at least to judge by reports that Kurdish negotiations with Damascus and the Russians are well advanced. In this game for the prize of Kurdish affections Damascus holds most of the cards. To begin with the Kurds have never fought or wanted to fight the SAA and never wanted independence. They do want a measure of autonomy which they would like to see guaranteed in a new federal constitution. Damascus will have difficulty swallowing that, not least because other restive areas like the South might also want autonomy. Assad will probably reckon that he can clinch a deal with a few concessions rather than a federal constitution: use of Kurdish language in schools, incorporation of the peshmerga into the SAA. He can afford to sit on his hands indefinitely: the small US presence in the remote Syrian Far East is no existential strategic threat to him, while the endless lingering will be a constant embarrassment to Trump. Most crucially of all, the Kurds know now, if they hadn’t realised it before, that one day the US tripwire will indeed be removed and they will get no deal at all from Damascus if they do not strike one now. We can expect to see bluster, smoke screens, reversals and and posturing on all sides in the coming days but ultimately it must be considered likely that at some point the Kurds, when they judge that no more concessions can be extracted from Assad, could ask the US to leave. Ah! That would upend everything. Actually they won’t even need to ask. All they have to do is conclude a deal. Then it will be game, set and match to Assad and the Russians. The real issue may soon become how to save American face and here we can expect to see some adroit Russian diplomacy. There is already talk of drafting UAE and Egyptian forces into Manbij, the key town under Turkish threat. Before we reach that point however we must address two loose ends. Firstly Trump’s statement, when he was under fire and needed an excuse, that the Turks were going to deal with ISIS. This idea is a total nonsense, but Bolton on the Turkey leg of his tour must go through the motions of exploring it with Erdogan. 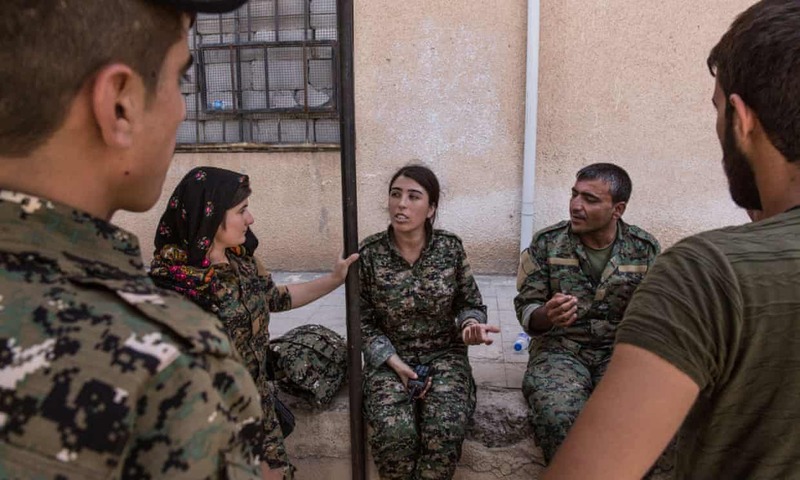 Kurds and SFD in Raqqa. Photo: Barcroft. He will be told that for Turkish troops to cross over a hundred miles of hostile Kurdish territory to deal with ISIS in Deir Ez Zor,Turkey would need the support of more US resources than are in the area already. Turkish generals are horrified at the idea. It will be quietly dropped. Anyway the preferred plan is for the US forces with the SDF to use all this new time at their disposal to do the necessary (except that, as mentioned, the SDF is something of a broken reed). Secondly, and this is even more absurd, Bolton says the US is not going to withdraw its ‘a couple hundred’ troops from the ‘key’ Al Tanf enclave which straddles the Syrian/Jordanian/Iraqi borders, because of its strategic position blocking completion of the fabled ‘land bridge’ which we are told links Iran with Syria and Lebanon. It is quite simply grotesque that anyone with pretentions to being a strategist can appear seriously to believe this and that the media dutifully regurgitate the US talking points on it without question. While it is true that Al Tanf has been an important crossing point, all we are talking about here is bit of inconvenience. There are other crossing points a few miles to the North East. Anyway Iran airlifts most of its supplies to Damascus and Beirut and wouldn’t dream of ferrying sensitive equipment through Iraqi territory, pullulating with US troops and agents. Don’t they have maps in the Pentagon? It can perhaps be most charitably assumed that the Al Tanf gambit is part of the face-saving which has to be done, this time to be able to claim that the US has ensured that Iran will not become more ‘entrenched’ (what does this much bandied about word mean? They never tell us) and Israel’s concerns are not being overlooked. 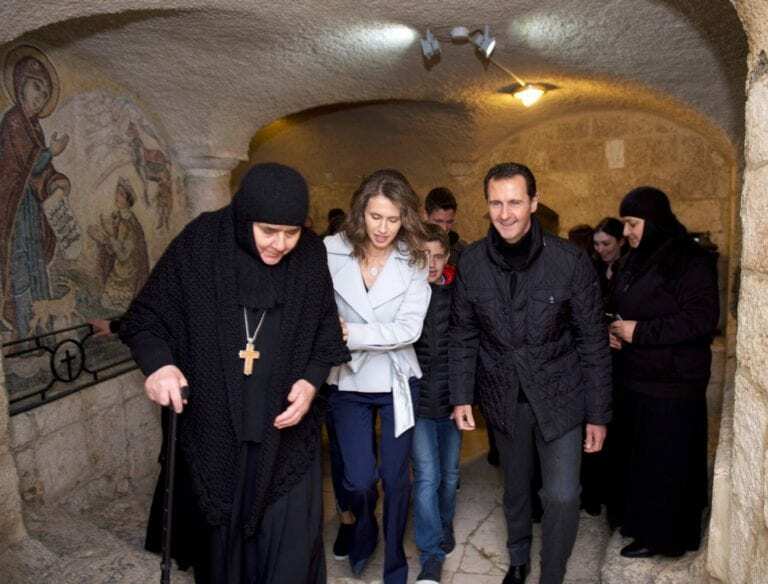 Asma and Bashar al-Assad visiting a Christian monastery in Syria, 2017. Meanwhile Syria’s rapprochement with much of the Arab world has proceeded apace. The President of Sudan visited. The UAE reopened its embassy. Bahrain says it will follow. Flights to Tunisia have resumed. It seems likely that Assad will be invited to the Arab Summit in March in Beirut and Syria will be readmitted to the Arab League. Italy is said to be close to reopening its embassy. The British Foreign Secretary, Jeremy Hunt, has sourly accepted that Assad is going to remain President ‘for a while’. Although reports that the British Embassy are being refurbished may turn out to be a false dawn, the day can surely not be far off when the UK informs Damascus that it proposes to reopen. However the issue will not be what concessions Syria must make to receive this favour but rather what concessions the UK must make if it is not be even more totally excluded from the diplomacy around the Syrian question than it is already. The Syrians would be remiss not to require a lifting of sanctions as a minimum. The most important aspect of these rapprochements is the economic one. Syria’s immense battle ahead is economic recovery. The gains on the battlefield may be eroded if the government fails to get the country on its feet again. The problems seem never ending. One small example: 84,000 children are fatherless, the offspring resulting from rapes and forced temporary marriages by jihadis. The Western media gleefully reckons that Syria needs $400 billion for reconstruction. The Western powers currently set their faces against contributing anything to this and indeed seek to push Syria deeper into the mire with punitive sanctions. A surer way of creating the conditions for a resurgence of ISIS could hardly be imagined. Hence the importance of rapprochement with the Gulf countries. While Trump’s claim that Saudi would pay for recovery was probably another of Trump’s mis-statements, it is not fanciful to imagine the big Gulf development funds – the Saudi, Kuwaiti and Arab Development Funds, and some of the UAE funds – providing enough to make a good start. 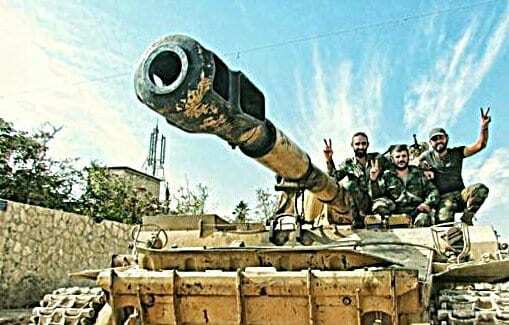 Syria in any case could not absorb huge amounts to begin with. Not least it would generate massive inflation. The Idlib issue, presently on hold, gets worse rather than better. Hayat Tahrir Ash Sham (HTS), the group everyone (except Qatar) considers terrorists, have fought and displaced other armed groups from a string of towns, some in the buffer zone which the Turks were supposed to have cleansed of the most radical groups. The groups in Idlib mount regular forays or artillery attacks into government-controlled areas, attracting air raids in retaliation. Within two days of each other John Bolton and Jeremy Hunt publicly reminded Syria that it must not run away with the idea that it could get away with more chemical attacks now that it seems to be in the ascendant. This seems to be the last lingering hope of all those who can never have too much Western military intervention in Syria, that an incident can be manufactured to justify heavy bombing. Unfortunately for them, the Syrians and Russians appear to be a step ahead: only the Russians seem to be doing any bombing. While a compliant media would dutifully echo possible Pentagon claims that any planes or helicopters were Syrian rather than Russian, or that black is white, this tactic does make that a tad more difficult. The article was first published with Dr. Tim Hayward.